In the second of two interviews with globally respected officials involved in the international sumo game, Sumo Scribblings recently threw a few questions over the Pacific to Andrew Freund, the face of the United States Sumo Federation. In many ways far bigger in the sport than his slim physique would indicate, Andrew is undoubtedly a man with a passion, on a mission, and well aware of the bigger picture surrounding the sport at the amateur level stateside and across the globe. Where did your own connection with sumo begin? I worked in Japan in the early ’90s, and was an admirer and student of several aspects of traditional Japanese culture. In terms of martial arts, I had practiced kendo as a boy (in the U.S.A), and I studied aikido in Japan. In those days, I was a loner, and didn’t really have a social life. One day, I picked up a copy of Tokyo Journal, and flipped through the calendar of events. I saw a listing for “Sumo Tournament” and decided to attend one day of the competition. In 1997, I attended the Japan Expo in Los Angeles with an American friend where we witnessed a sumo demonstration. At the end, audience members were invited to step forward and try it. Thus my initiation into sumo began, with a few practice matches against my friend. Within weeks of that experience, I had started my own sumo club, with thrice weekly practices. Do you continue to enter the ring as an amateur? Yes, I have practiced and competed in sumo for about 14 years. I’ve practiced for over 1,000 hours over the years and (have) also competed in dozens of competitions, locally, nationally and representing the U.S. National Team. I’ve done fairly well in the lightweight division in competitions, often winning medals, including gold (though not against international teams)! My biggest achievement (to date) in sumo was defeating Trent Sabo, the perennial U.S. lightweight champion (a couple of years ago). He is truly a legend in sumo in this country and actually won a bronze medal at the World Sumo Championships. That match was like a kinboshi (gold star) for me! At 85 kg, he’s known for toppling guys who are 200+ kg on a regular basis! What are some of the challenges of developing sumo in the United States? There are several major challenges in developing sumo in the U.S. These include lack of support, geographical issues, and cooperation challenges. 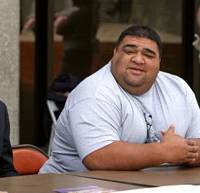 The U.S. Sumo Federation does not have any external source of funding or support. (Other nations) enjoy significant government or private funding, that helps to cover training, coaching, travel expenses and more, for many of the top athletes. Meanwhile, without any support, the U.S.SF does its best to generate revenue from ticket sales, entry fees, etc. and we use this revenue to (cover) travel costs for athletes competing in the World Sumo Championships each year. Even then, the funds cover just a portion of air fare for each athlete. In terms of training facilities, every club here has to be responsible for their own expenses so training is often haphazard, equipment is sometimes sub-standard and training locations may be in outdoor parks (to save on rental expenses). These challenges vary from club to club. There is also a lack of cohesiveness and unity within the federation, because most members rarely see or communicate with members in other clubs. (That said), I am happy that, at the moment, the current trustees and officers of the USSF are in regular communication, and we seem to have made a lot of headway in the past year. What are some of the keys and positive steps you have taken to promote sumo? Since I started practicing and formed a sumo club in 1997, a lot has happened. The first few years, my only focus and intention was to create a club, where interested members could practice sumo as recreation. I was holding practices three times a week at UCLA, where I teach. We were very fortunate to have two-time World Sumo Champion, Svetoslav Binev (of Bulgaria) join U.S. and coach U.S. on a regular basis for several years in the late ’90s and early 2000s. After producing several smaller sumo events, in 2001, I produced the first U.S. Sumo Open. On a whim, I invited (former ozeki) Konishiki, and much to my surprise, he agreed to come! We are now about to hold the 11th annual U.S. Sumo Open on June 25, in Las Vegas, Nevada! Are there any misconceptions and misunderstandings about sumo in the United States? Yes, of course. Since sumo is relatively new as a participant sport here, and also relatively obscure as a spectator sport, there are numerous misunderstandings that appear again and again, year after year. One of the biggest (which I personally get a lot) is “You’re not big enough to be a sumo wrestler!” I weigh about 70 kg, and have done everything in my power to gain more weight, including eating day and night for months on end, but to no avail! So how, if at all, has sumo developed beyond just competitions stateside? Once we established good practice routines, and began to produce events, many other unexpected opportunities arose. In particular, sumo as entertainment has, understandably, been a big hit — after all, we are in Los Angeles, I.e. Hollywood! I have served as a Sumo Consultant for numerous movies and TV shows, including films like “Memoirs of a Geisha” and “Oceans 13”. These projects each took about half a year of full-time work, coordinating every aspect of production for sumo scenes, Needless to say, 90% of our work was never shown in the films, and less than 1% of footage taken actually made the final cut! In addition, I’ve worked on dozens of TV commercials and print jobs involving sumo. Another one of the cool campaigns was the KGB commercial (not the Russian KGB!) that actually debuted during the 2010 Super Bowl, the #1 TV event in the nation, with 106 million viewers! What is your take on amateur sumo today on a global scale? There are a lot of positive things that have come out of sumo’s growth internationally. I feel that ongoing cultural exchange throughout the world is generally beneficial. Nevertheless, there are always growing pains. As sumo develops internationally, it becomes apparent that there is divergence in the visions of many key individuals and national federations. (There are) splinter groups, bitter rivalries, struggles for power, and all the usual intrigues. It is yet to be seen how many of the troublesome issues will be resolved. For some years amateur sumo has been trying to be noticed by the IOC with a view to becoming an Olympic sport. Recognition to some degree exists, but with the lack of openness regarding the IFS, internal bickering in amateur sumo and supposed links to the yaocho issue, do you see the IOC full recognition bid as in danger of perhaps being derailed? From my position, it’s hard to say which specific issues are the most critical when dealing with the IOC. In terms of the myriad of pro-sumo scandals, those situations are really out of our hands. The best we can collectively do in international (amateur) sumo is to continue our efforts to develop strong competitors and successful tournaments! (One) of the most important steps is for U.S. to improve communication among national sumo federations and the ISF — all parties involved need to understand each other to be more cohesive and to work for common goals. Which nations do you see as leading the world in amateur sumo? Definitely Japan, Mongolia and Russia are tops, with several eastern European nations (like Ukraine, Poland, Bulgaria, etc.) as perpetual challengers! In your lifetime, do you see amateur rikishi making up part of the Olympic team? If not — why not? That’s a very difficult question. I think all of U.S. in international sumo hope for that, but it’s very hard to say. No matter how much effort many of U.S. put into the sport personally, there are always political elements when it comes to the IOC that I think are largely out of our personal control. As with many things in life, we just have to put forward our best efforts toward goals that are meaningful to U.S. To some extent, the tangible results in the end are secondary. As they say, the journey itself is of greater importance, and so far, I can say that it has definitely been very interesting. At time of writing, it is understood that the May 8-22 Natsu Basho will be taking place. Initial indications are that the tournament, while toned down in form, and will possibly include free access for fans as well as the opportunity to make donations for disaster relief for all those affected by last month’s devastating earthquake and tsunami in Tohoku.